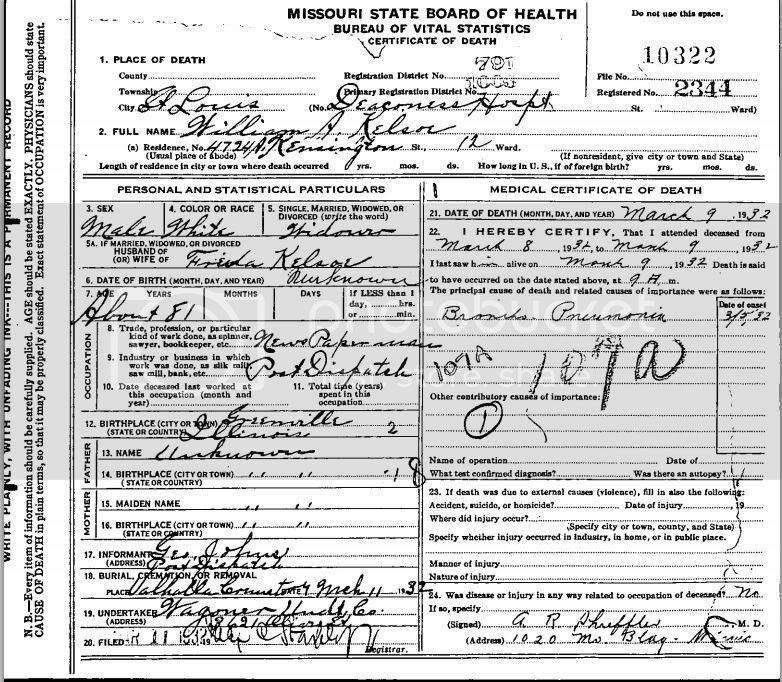 Died: February 12, 1953, St. Louis, MO, age 78---d. heart disease in Maplewood nursing home. Buried: Catholic Calvary Cemetery, St. Louis, MO. 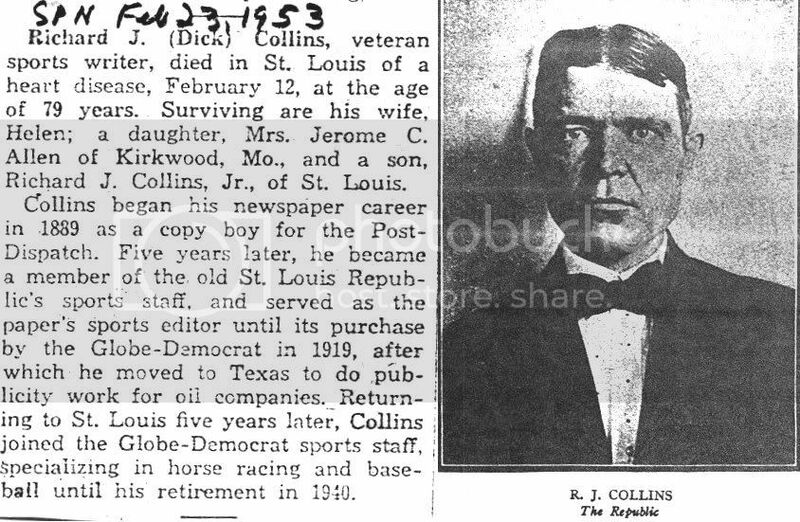 St. Louis Globe-Democrat, sports writer, 1924 - 1940, retirement, specialized in horse racing / baseball. Sporting News' obituary, February 25, 1953, pp. 30. Last edited by Bill Burgess; 03-25-2014, 01:49 PM. Eastern League, secretary, 1911 - ? Cleveland Leader, baseball editor, 1916 - ? Syracuse Stars Press representative, 1920 - ? 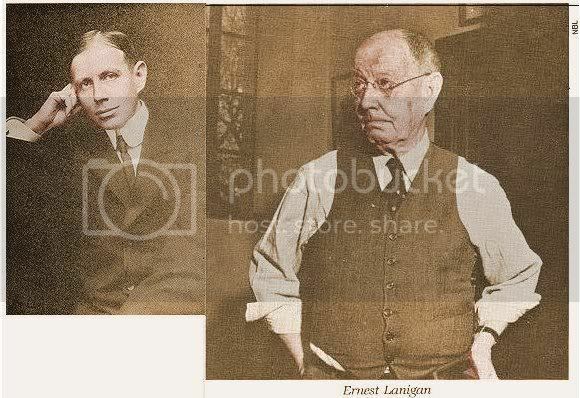 Ernest John Lanigan (January 4, 1873 - February 6, 1962) was an American sportswriter and historian on the subject of baseball. He was considered the premier baseball statistician and historian of his day. He was a pioneer at gathering information about baseball statistics and about the players themselves, and was the author of the first encyclopedia of the subject. In addition to having parents who were both writers and editors, Lanigan was the nephew, on his mother's side, of The Sporting News founders Al Spink and Charles Spink, and one of five men in his family, including J. G. Taylor Spink and C.C. Johnson Spink, to gain acclaim as a newspaperman. Shortly after The Sporting News was launched in the mid-1880s, 15-year-old Lanigan went to work for his uncles. He served three years at the paper, then made a career change and became a bank clerk for the next eight years. His knowledge of baseball and writing, and his passion for numbers, accrued from those two jobs, would serve him well in the future. However, he also came down with a lung infection, possibly pneumonia, which affected his health for the remainder of his long life. During a two-year convalescene in the Adirondack Mountains, he continued his baseball stat gathering for The Sporting News, as he had during his banking career, and began inventing new statistics. The best known of these were the RBI and the CS, which he researched and catalogued, and which were eventually adopted as official major league statistics. He also developed a more comprehensive list of Winning Pitcher and Losing Pitcher compilations. 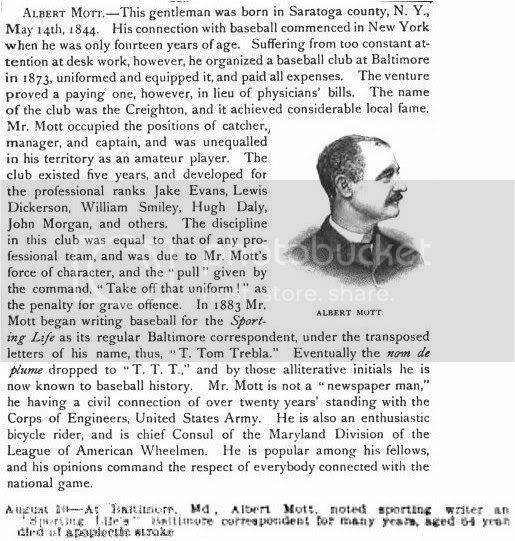 Over the course of his career he also worked for the New York Press as sports editor until 1911, and was the official scorer for some of the early World Series; as sports editor for the Cleveland Leader. He worked as secretary and information director of the International League around the time when they were reorganizing from their previous incarnation as the Eastern League. At one time he was also the business manager of a couple of St. Louis Cardinals farm teams. 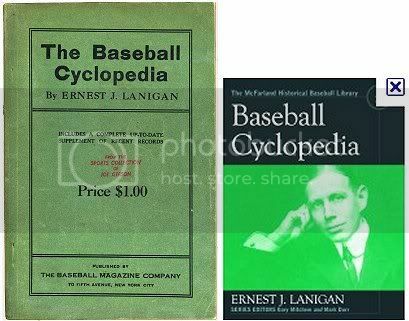 Lanigan also wrote for Baseball Magazine, and it was under that banner that he compiled and published the first baseball encyclopedia, which he called the Baseball Cyclopedia, in 1922. 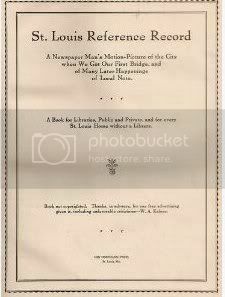 The publisher advertised on the book's title page that it "comprises a review of Professional Baseball, the history of all Major League Clubs, playing records and unique events, the batting, pitching and base running champions, World's Series' statistics and a carefully arranged alphabetical list of the records of more than 3500 Major League ball players, a feature never before attempted in print." In 1946, Lanigan was named curator of the National Baseball Hall of Fame and Museum, and later served as its historian. He held that post until he retired in 1959, when he was replaced by Lee Allen, who continued Lanigan's work in compiling biographical stats on players. Lanigan was called "Ernie" by his friends. He was also given the not-necessarily-flattering nickname of "Figure Filbert" (or "Figger Filbert") by Damon Runyon, as a more poetic way of saying "numbers nut". Lanigan affirmed that characterization, as he once confided to fellow baseball writer Fred Lieb: "I really don't care much about baseball, or looking at ball games, major or minor. All my interest in baseball is in its statistics. I want to know something about every major league ball player, not only what he is hitting, but his full name with all middle names and initials, where they were born, and where they live now." Lieb, who was still among the living at Lanigan's centennial in 1973, called him "the patron saint of SABR". Last edited by Bill Burgess; 03-24-2014, 03:26 PM. 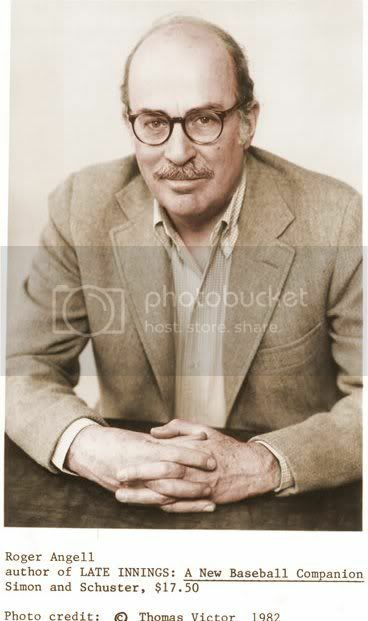 The New Yorker (magazine), fiction editor / general contributor, 1956 - ? Father: Ernest Angell, born June 1, 1889, Cleveland, OH; Mother: Catherine Sergeant, born 1892, Massachusetts; Wife: Evelyn Ames Baker, Married October, 1942, divorced, 1963; 2nd Wife: Rogge. 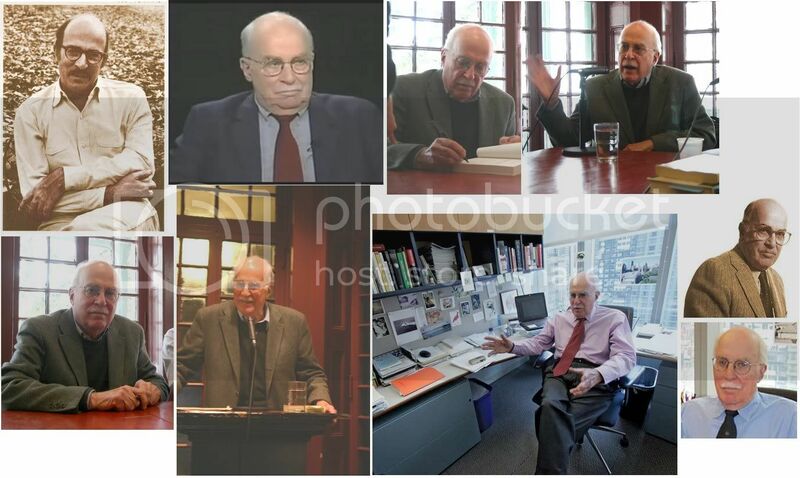 Roger Angell (born September 19, 1920), has been a regular contributor to The New Yorker and was its chief fiction editor for many years. 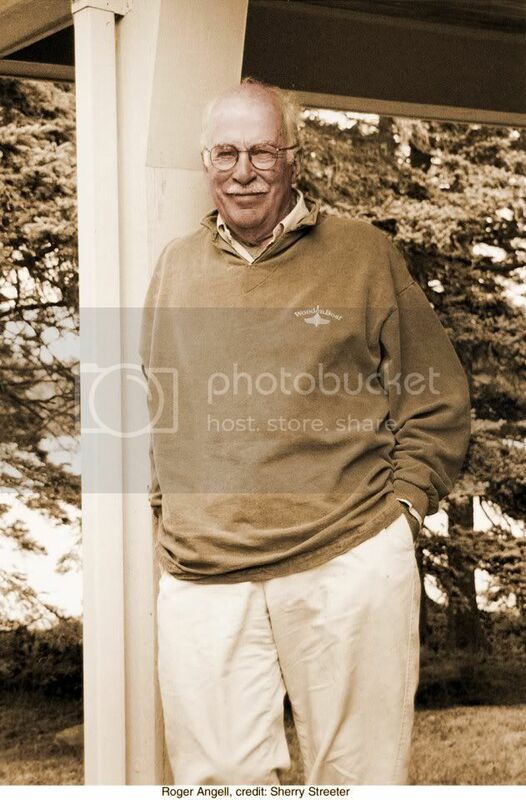 He has written many memorable essays on baseball as well as numerous fiction, non-fiction, and criticism pieces, and formerly wrote an annual Christmas poem for the magazine. Angell's earliest published works were pieces of short fiction and personal narratives. Several of these pieces were collected in The Stone Arbor and Other Stories (1960) and A Day in the Life of Roger Angell (1970, ISBN 0-670-25916-0). He first wrote professionally about baseball in 1962, when William Shawn, editor of The New Yorker (for which his mother and stepfather worked from the 1920s through the 1970s), had him travel to Florida to write about spring training. A Pitcher's Story (2001, ISBN 0-446-52768-8) is the book-length result of a year that Angell spent speaking with New York Yankees pitcher David Cone and Cone's family, friends and coaches. Angell has been called the "Poet Laureate of baseball" but dislikes the term. In a review of Once More Around the Park for the Journal of Sport History, Richard C. Crepeau wrote that "Gone for Good," his essay on the career of Steve Blass, "may be the best piece that anyone has ever written on baseball or any other sport." Last edited by Bill Burgess; 03-24-2014, 02:50 PM. Died: February 5, 1913, Pittsburgh, PA, age 52---d. at home of nervous breakdown. 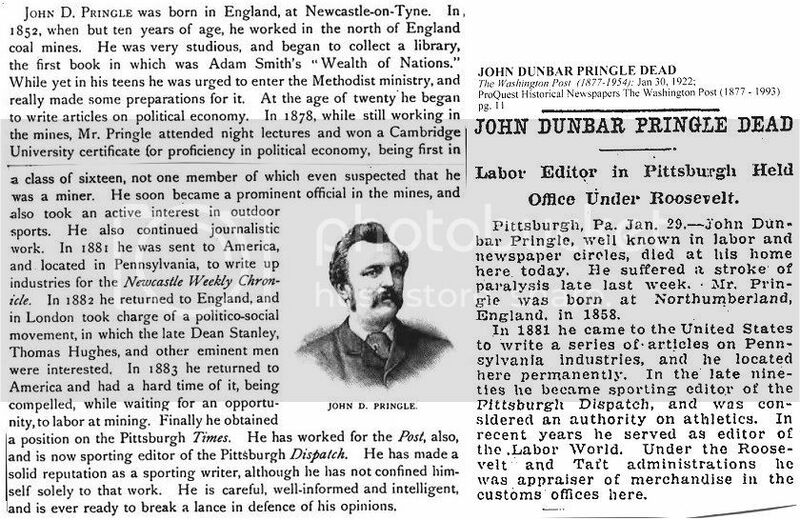 Pittsburgh Leader, sports writer, 1888 - 1893, sports editor, 1893 - 1897? According to the 1910 census, he managed theaters. Sporting Life, November 5, 1898, pp. 1. 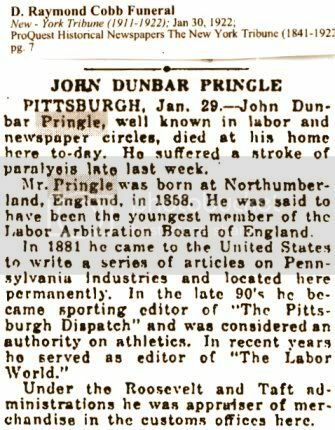 Sporting Life obituary, February 22, 1913, pp. 13. Washington Post obituary, February 6, 1913, pp. 4. Last edited by Bill Burgess; 03-24-2014, 02:34 PM. 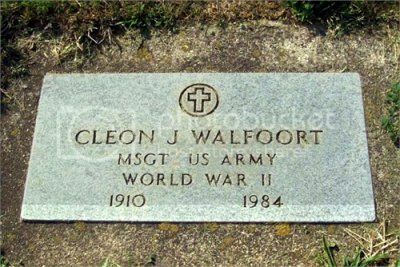 Died: February 28, 1984, Milwaukee, WI, age 73,---d. Milwaukee St. Mary's Hospital burn center of burns received in a fire on January 30, 1984. Promoted to sergeant with the Army at Richmond, VA, December 31, 1942. Sheboygan (WI), sports writer, February 22, 1950? - ? --------------------------------Sporting News' obituary, March 19, 1984, pp. 49. ---------------------------------Official Baseball Guide, 1985.-----------------------------------------Cedar Crove Cemetary, Cedar Grove, Wisconsin. Last edited by Bill Burgess; 03-24-2014, 01:45 PM. 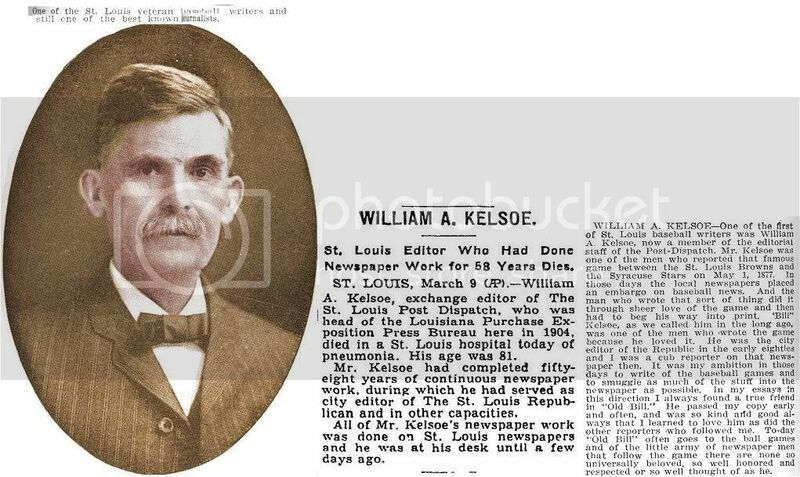 Died: March 9, 1932, St. Louis, MO, age 81,---d. Deaconess Hospital. --------------------------------------New York Times' obituary, March 10, 1932, pp. 21. Last edited by Bill Burgess; 03-24-2014, 01:19 PM. Philadelphia Inquirer sports editor, 1884 - 1910? 25% owner of Philadelphia Athletics, 1901 - fall, 1912, sold his shares to Connie Mack. Had good knowledge of many sports. 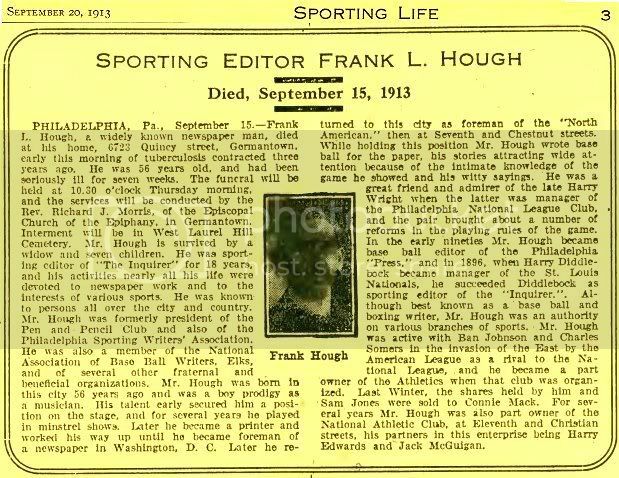 Sporting Life obituary, September 20, 1913, pp. 3. ------------------------------------------------Philadelphia Inquirer obituary, September 16, 1913, pp. 8.--------------------------------Appeared in 1889 book. Last edited by Bill Burgess; 03-24-2014, 12:18 PM. Managed some boxers, Frankie Burns, Clay Turner, Martie McCue, Billy Ryan. New York Times' obituary, May 5, 1928, pp. 17. Last edited by Bill Burgess; 03-24-2014, 11:07 AM. Family lived in Toledo, Ohio, as of 1880. Cleveland Newspaper Enterprise Association, sports writer, 1910 - February 22, 1913? ------------------------------------------Circleville Herald (OH) obituary, April 18, 1935, pp. 4. Last edited by Bill Burgess; 03-24-2014, 10:38 AM. Last edited by Bill Burgess; 01-04-2009, 08:15 PM. Died: January 30, 1946, Winchester, MA, age 83,---d. after a long illness. 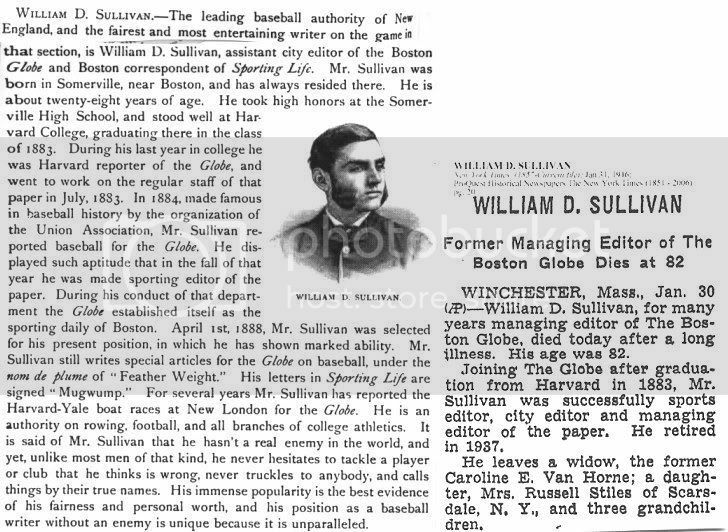 Boston Globe, sports editor (July, 1883), assistant city editor (April 1, 1888), city editor, managing editor. Retired in 1937. ---------------------Appeared in 1889 book----------------New York Times' obituary, January 31, 1946, pp. 20. Last edited by Bill Burgess; 03-24-2014, 09:42 AM. Father: Israel, born Russia, 1870? ; Mother: Sarah, born Russia, 1877? 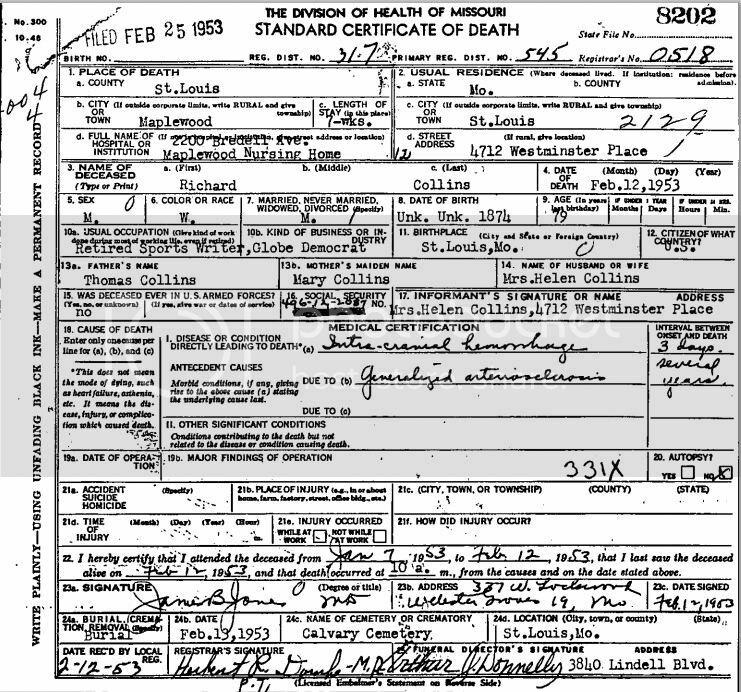 ; Wife: Ruth Prels; Wife: Sadie, born around 1915, died June 6, 1979, NYC; Daughter: Elizabeth; Son: Henry Hank. ---------------------------Sporting News' obituary, February 5, 1990, pp. 43.------------------- Intelligencer obituary (Doylestown, PA), January 18, 1990, pp. 18. Last edited by Bill Burgess; 03-24-2014, 08:44 AM. 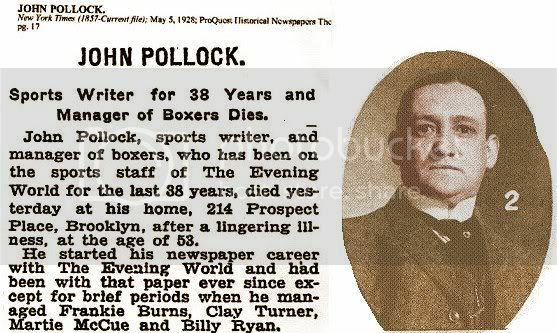 Sporting Life obituary, August 15, 1908, pp. 2. -----------------1909 Reach Official AL Guide, pp. 418. Last edited by Bill Burgess; 03-23-2014, 06:02 PM. Died: January 29, 1922, Pittsburgh, PA, age 68---d. at home. Had suffered paralytic stroke at home a week earlier. 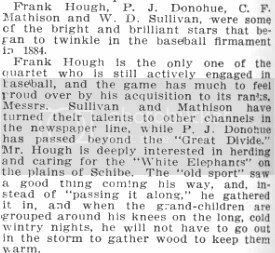 Pittsburgh Dispatch, sports editor, 1896? - 1899? ---------------------------Appeared in 1889 book-----------------Washington Post obituary, January 30, 1922, pp. 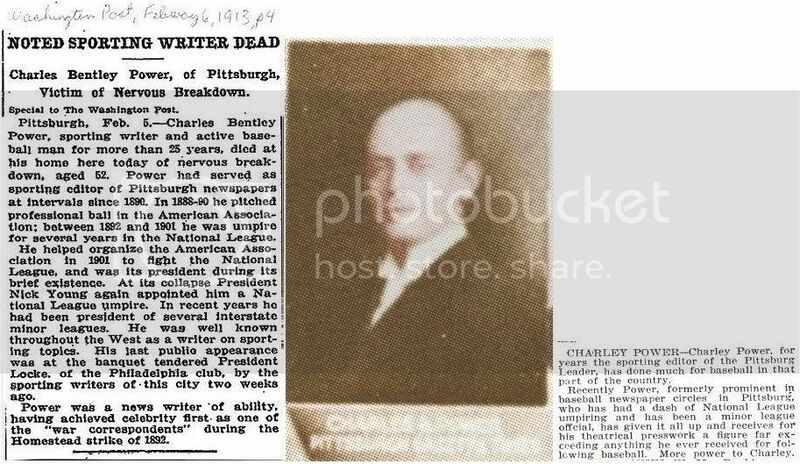 11.---New York Tribune obituary, January 30, 1922, pp. 7. Last edited by Bill Burgess; 03-23-2014, 05:34 PM. Last edited by Bill Burgess; 01-04-2009, 08:18 PM. All times are GMT-8. This page was generated at 05:39 AM.